Just a few days left for the most popular and awaited festival of the year, Christmas. Everywhere one can find special arrangements and carnivals to welcome the auspicious festival and Santa Claus to bring the happiness in the world. The festival of gifts, love and care is simply incomplete without special promotions, offers and bonuses. Everybody loves to grab them offline as well as online. Thus, Christmas is the time when people expect freebies and rewards. To fulfill their expectations, many online as well as offline shops, restaurants and brands come up with special Xmas deals and promotions to reward players. 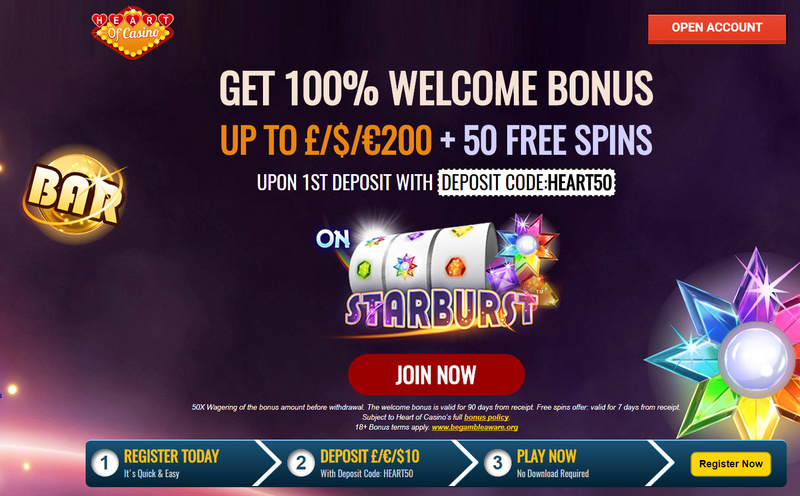 Heart of Casino, a popular online casino site, also unveils special Christmas and New Year offers and promotions to reward players like never before. As Xmas brings the end of the year and people indulge in prolonged festivity to welcome New Year, the site brings special bonus packages and promotions to extend the celebrations. To make winter season warmer and happier, the site also unveils special Christmas promotions for the month of December. Players can participate in Xmas promotions to win bigger and play better to become happier than ever. The site has many Xmas promotions for the month of Dec. One of the best promotions is Santa Bonus in which gifts keep coming in players’ kitty round the clock until Xmas. The second is Christmas Unwrap where players can unwrap many exciting goodies and instant cash prizes. Last but certainly not the least is 12 Days of Christmas Tournament wherein players can enjoy 12 days for sheer Christmas entertainment and rewards. In all these promotions, players can find best bonus deals and offers. Players can also participate in The More, The Merrier wherein players can enjoy Christmas Free Spins. The promotion will start on December 18th and players will get a chance to receive free spins into their accounts on making deposits. If players will make deposits on 5 different days with a code XMAS by December 24th, they will get an extra surprise of Free Spins on December 25th. Apart from that, the site also offers special jackpot promotions such as Live Dealer Weekend, Weekend Roulette and Weekly Surprise wherein players will get a chance to win hefty payouts, cashbacks and jackpots. Those who love to play free games a lot can participate in Happy Hours to get extra games and spins during the Christmas month. However, the biggest surprise comes for new players. If anyone joins the site during this month, he will get a whooping signup bonus package of 100% welcome bonus along with free spins. Also, the package includes up to 100% match bonus on next two deposits. In short, Heart of Casino is all set to welcome Christmas and New Year with a bang. With so many promotions, hefty payouts, incredible jackpots and rewarding games, the site leaves no stone unturned to make this Christmas a best one for players. For more updates on special promotions and offers, stay tuned with the site.